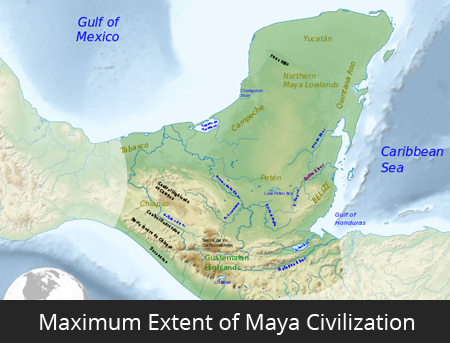 Maya Civilization is one of the best-known classical civilizations of Mesoamerica. This sophisticated civilization was made up of more than 19 million people. It influenced even future empires. The Maya Civilization dates back 4,000 years, around 2,000 BC. The beginning of this civilization is called the Preclassic or Formative Period. Some major cities of the Maya Civilization where Tikal, Copan, Chunchucmil, Bonampak, and Palenque. They derived various religious and cultural traits like pyramid building, inscribing of monuments, and city construction. They worshiped various gods related to nature. The beginning of this civilization is called the Preclassic or Formative Period. The classic Maya period is the era that saw the consolidation of power in the great cities of the Yucatan Maya. They were the first ones to process cacao to make chocolate. They wrote books in their hieroglyphic script on long strips of a special type of paper made from the inner bark of fig trees. They had their own system of hieroglyphic which was one of the most complex systems on Earth. The Mayans were great astronomers and efficient mathematicians. Tikal was the largest Maya center. It covered an area of 123 square kilometers. Their main crops were maize, beans, avocados, papayas, and cacao etc. They also played various sports. The Mesoamerican ballgame, also known as Ollamaliztli was the main sport. The Mayans were the first one to use sweat bath or the Sauna. The last independent Mayan kingdom was the island city of Tayasal. It existed until 1696. Declan, Tobin. " Fun Facts about Maya Civilization for Kids ." Easy Science for Kids, Apr 2019. Web. 23 Apr 2019. < https://easyscienceforkids.com/maya-civilization/ >.